Helping run one of India’s hottest online travel start-ups means not just doing the daily stuff right but also keeping track of the latest developments in technology, marketing and the travel business. And especially in those specialist areas where all three meet. news.google.com Google News is a great place to begin your day in the morning, catching up on news while sipping coffee. I really like their layout and the cool categorization of news based on interest and geography. The remarkably smart automatic news aggregator offers versions for several countries including India, which now also has Tamil, Telugu, Malayalam and Hindi avatars. www.law.com If you want to look up all things legal, law.com is the place to start. It does not cover Indian laws but since Indian legal philosophy is quite close to Western legal thought (specially in the domain of cyberlaws and e-commerce), it still serves as a nice reference site. The site also hosts a number of law blogs, legal sector news and, yes, fresh lawyer gossip. 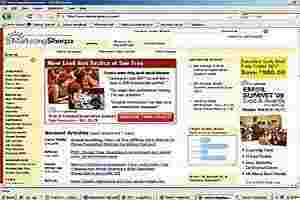 www.marketingsherpa.com A good site for “actionable" marketing ideas. MarketingSherpa is a marketing research firm that publishes reports accessible to the entire online community. While most of the content is open only to subscribers, there is a lot of free — and useful — content as well. Paid subscribers get access to case studies, surveys, research and frequent reports and handbooks on marketing. www.gigaom.com GigaOM is a superb blog for breaking news and incisive analysis in the tech space. Om Malik is a true pioneer in the blogosphere and I guess he really deserves the kudos that has come his way. The fact that he is an Indian makes it even better. Malik’s blog is a very serious player in the tech media scene and is co-authored by an experienced team of writers and journalists. www.hotelmarketing.com This 11-year-old website is a must-visit for anyone in the online travel domain. They aggregate travel-related news so one gets a pulse of the the industry. It’s also a great place to pick up ideas for Internet-based direct/social marketing professionals. Dharmendra Yashovardhan is chief operating officer of www.ixigo.com, a comprehensive travel search engine for Indian consumers that aggregates information on domestic flights, hotels and bus schedules. Ixigo will shortly expand to international flights and hotels.